Spelled with Western femal riding characteristic items with Western style icon colors, the image is unique and lovely. Great for T-shirts, Sweaters, Hoodies, Vests, and Jackets. A typical Western poster image of Cowgirl character. The image can be applied onto T-shirts, Shirts, Vests, Sweaters, Hoodies, and Jackets. With this image, you will turn a regular item into a great memorable gift. 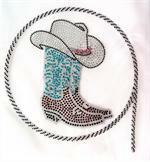 A bueatiful and colorful rhinestone image setting for Western lift style promote. Lovely and unique on T-shirts, Sweatshirts, Hoodies and Jackets. A lovely image which carries a lot of meanings. Use this image for someone who is special.